Cash damming is a strategy that allows taxpayers to keep their cash resources, mainly borrowings with non-deductible interest to pay personal expenses, while business expenses are met using interest-deductible borrowings. With this technique, debt with non-deductible interest can be gradually converted into debt with fully deductible interest. How does cash damming work? First, two separate bank accounts must be opened; one for depositing all business cash receipts and another account with a line of credit for paying all business expenses. In this way, interest from the line of credit incurred to pay business operating expenses is clearly identifiable for income tax purposes. The first objective is to eliminate as quickly as possible all personal debts with non-deductible interest, and to replace them with debt with fully deductible interest using the line of credit. The higher a self-employed person's operating expenses, the faster the conversion. Who is cash damming for? This strategy is mainly useful for unincorporated self-employed persons. Partners of a general partnership may use it with some modifications. Individuals who own rental property may also find this strategy useful. Currently, salaried employees may not put cash damming to use. In this example, business income of $250,000 is deposited in the receipts account, which is used to pay $90,000 of personal expenses and $60,000 of taxes. The remaining $100,000 is used to pay down the outstanding mortgage balance. The $100,000 of business expenses are funded through the line of credit. 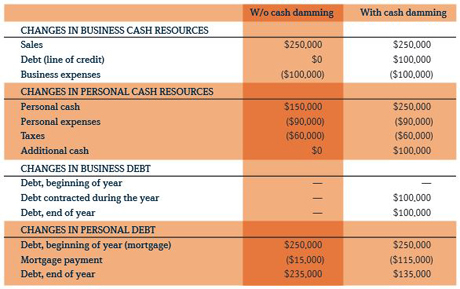 Following implementation of the cash damming strategy, Mr. David has the same combined level of personal and business debt of $235,000 as without the strategy. However, interest on the business line of credit is now deductible, and his personal debt on which the interest is not deductible has decreased from $235,000 to $135,000. After two or three years of this strategy, the mortgage on the principal residence will be fully paid and all debt will be business debt. In theory, this strategy is very simple. In practice, financial institutions must ensure that accelerated repayment of debt (a mortgage in our example) is allowed under the loan agreement. Is Mr. David allowed to make a single $100,000 payment on his mortgage? Individuals' debt level can also be a problem when funds drawn from a line of credit are added to a mortgage balance. For some, their financial situation is such that the total debt level (mortgage and line of credit) is not a problem, while others with weaker financial situations might have problems obtaining a line of credit.